Bloomsbury USA Childrens, 9781599904184, 32pp. This is the seed of a unique and inspirational picture book text, that is part historical, part poetry, and entirely inspirational. It symbolically takes the reader through the cumulative story of the US Civil Rights Movement, showing how select pioneers' achievements led up to this landmark moment, when we have elected our first black President. 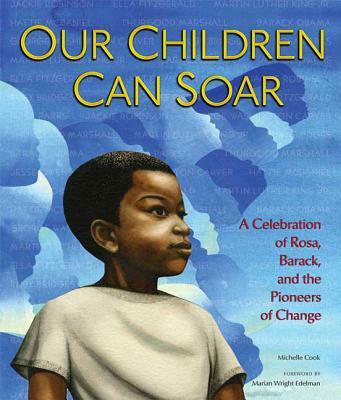 Each historical figure is rendered by a different award-winning African-American children's book illustrator, representing the singular and vibrant contribution that each figure made. Lending historical substance, the back matter includes brief biographies of: George Washington Carver, Jesse Owens, Hattie McDaniel, Ella Fitzgerald, Jackie Robinson, Rosa Parks, Ruby Bridges, Thurgood Marshall, Martin Luther King Jr., Barack Obama.